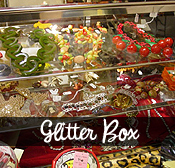 The Cats Pajamas, the purr-fect online source for vintage clothing, vintage accessories, vintage costume jewelry and more! Here you’ll find an absolutely fabulous collection of the best vintage fashions, from antique clothing of the Victorian era to outrageous vintage designer items of 1980s, a simply irresistible collection of vintage apparel all in one easy online shopping experience. Whether you’re shopping for yourself, a friend, or you’re a member of the creative or design community, Miss Kitty hopes you enjoy browsing the 3600 or so items in our cat-alog!